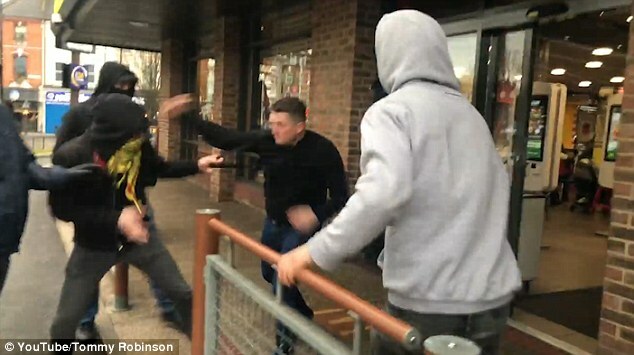 This is the moment EDL founder Tommy Robinson got into a brawl outside a McDonald's with masked men. Robinson, real name Stephen Yaxley-Lennon, says he was in London to film people going to a 'left-wing conference'. The film shows a group of around seven men wearing balaclavas or covering their faces walking towards Robinson, 35, at a retail park in north London. In the video posted on his YouTube page, Robinson says he saw "six or seven men coming towards me" and "four of them went for me" while others allegedly attacked his cameraman and camerawoman. Robinson can be heard asking if they wanted to go 'one on one' before punches and kicks are thrown from both sides. He added: "I’ve done more scrapping as a journalist than I did going football." Robinson appears to drop his camera as the men storm towards him. From the footage, it appears they are trying to stop Robinson filming them. There are brawls on the floor of the car park and outside the McDonald's with several kicks and punches thrown. At one stage Robinson charges the men before being forced to the floor and kicked. Once the masked men have left the scene, a bystander asks Robinson if he is all right and shakes his hand. No-one was seriously injured. It is not known who the attackers were or what their motive was. In the footage, Robinson complains about the police and alleges they will not investigate the incident because they cannot identify the attackers. On Saturday evening, Robinson tweeted: "I’ve done more scrapping as a journalist than I did going football." Robinson previously founded the European Defence League, as well as being co-founder and spokesman of the EDL. For a short time in 2012 he was also the joint party vice-chairman of the British Freedom Party.